Buried at work under a landslide of responsibilities? Dig yourself out with Avalancher, the latest offering from developer SinisterSea, and you’ll realize that there’s at least one cute little lost Eskimo who is worse off. 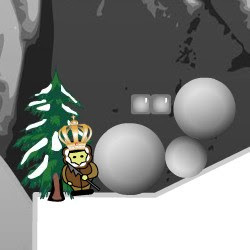 Find a “safe” spot for your Eskimo, build a protective igloo around him, and then unleash a hell of icy boulders. If you’ve done your job correctly, your Eskimo will survive and you’ll be rewarded with new levels and points based on your performance. Simple, clean graphics are accompanied by some chuckle-worthy sound effects. The game is also fairly short, and while you may get stuck for a bit on the final levels, a little persistence will usually win the day. On the downside, the trial-and-error nature of the game may turn some folks off. You’re not really given any clear indicators about where the avalanche will begin, and the physics-based nature of the game also adds a bit of luck to the mix. The hero also carries a harpoon. I guess he's either really lost, or simply intent on reinforcing Eskimo stereotypes. Criticism aside, hiding from a deluge of angry snowballs is a pretty cool way to kill fifteen minutes. i like seeing the eskimo get taken down!